Few of the best picks for wooden chess sets with different carving techniques and wide price range. Wooden chess sets are beautiful, timeless objects that have been prized for their elegance and craftsmanship since their invention. Even today, they command high prices at auctions and antique shops across the globe. There are so many different styles to choose from, with each craftsman choosing different types of wood to work with, selecting a different style of chess pieces to incorporate, and putting their own unique mark on each wooden set they make. That’s an almost uncountable number of combinations right there! In a world where chess sets are becoming more and more eclectic and inventive, where they’re being made out of all different types of strange materials, wood still remains the single most popular choice among players of all levels. When you’re looking for a chess set that will function well while looking good, wood is the perfect choice. But which wooden chess set is right for your situation? After all, it is one of the most popular materials – so there are a lot of wooden chess sets to choose from! Scrolling through page after page of listings online, one could easily find themselves overwhelmed within minutes! That’s why we’ve taken care of that part for you. We waded through countless product listings for wooden chess sets that stand for sale so that you wouldn’t have to, and we’ve curated a list of the best products we found while doing so. Our easy-to-digest list is of a much more manageable size, and it shows you only the best of the best when it comes to wooden chess sets. The list below will outline a few of the best choices in each price range so that you can easily decide on the best wooden chess set for you. This traditional wooden chess set is a luxury product from the prestigious chess brand, The House of Staunton. The most high end chess sets come from this well-known manufacturer. The Golden Collector Series Luxury Chess Set is made up of three different pieces, all hand crafted to the highest quality standards: the chessboard, the chess pieces, and the chess box. 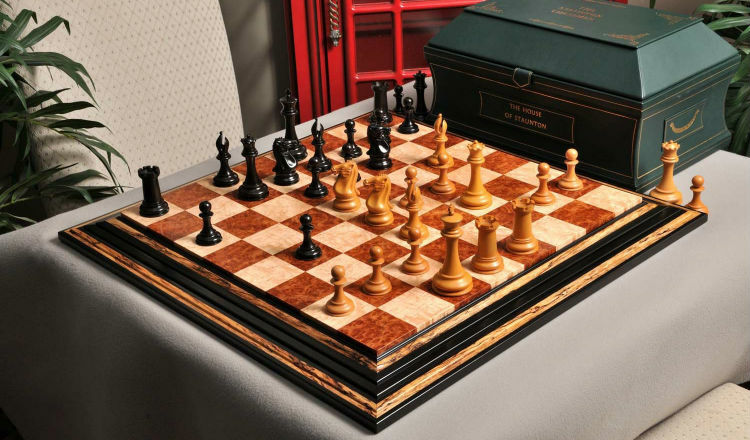 The chessboard is handmade in the United States out of Red Amboyna Burl for the dark squares, Bird’s Eye Maple for the light squares, and Spalted Maple as a decorative inlay around the rim of the board, just inside the stylized Genuine Ebony frame. The result is a beautiful playing surface with shiny finish that is truly a work of art. 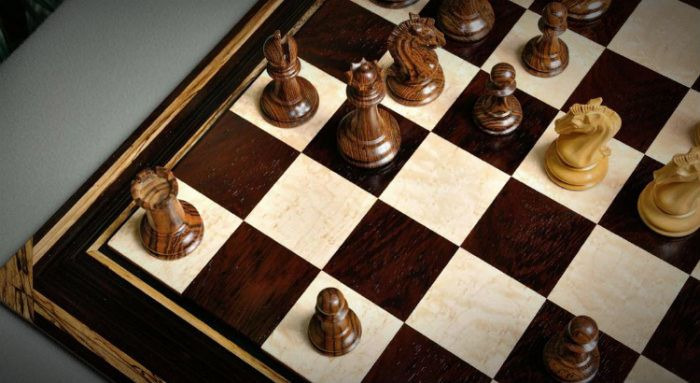 This board works well as a perfect battleground for your chessmen or a beautiful display surface for decorative purposes. The chess pieces are advertised as being, “as close to perfection as can be achieved by human hands”, and we would have to agree with that assessment. The pieces are each sculpted from the highest grade Boxwood and Genuine Ebony available, and each one is hand carved and hand turned by master artisans who put a lot of pride into their work. The pieces are a standard club size, with a 4.4 inch tall King that has a 2 inch diameter base. The box is the final piece of The Golden Collector Series Wooden Chess Set, often overlooked, but providing tons of value to the set as a whole. Whenever the pieces aren’t in use, they can be stored in this custom made box, each in their own perfectly molded compartment that keeps the pieces from rubbing together and wearing out faster. The box is handcrafted in the United States from the finest of English leather. It looks good while keeping your top of the line chess pieces protected during transport or storage. 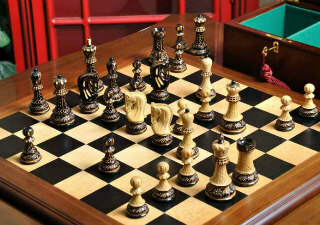 This luxurious wooden chess set was featured in Wired Magazine for a good reason- it’s gorgeous! It has the traditional design of the quintessential wooden chess set, elegantly executed with high end materials and impeccable craftsmanship. This wood chess set consists of the chessboard, chess pieces, and a custom chess box for storage. The board is the foundation of the set, and it makes for a fine one with smooth and shiny squares of Bird’s Eye Maple and African Palisander surrounded by a Spalted Maple inlay with corner detailing and a sculpted African Palisander frame. This board has a striking contrast between light and dark squares with the creamy white of the Bird’s Eye Maple set against the rich, mahogany brown of the African Palisander wood. The chess pieces of The Camaratta Signature Series Cooke Chess Set are a perfect reproduction of the original Staunton pattern, the most enduring pattern for chessmen in the game’s history. Each piece is incredibly detailed, with a smoothness and clarity of lines that is unmatched in other handcrafted pieces. One slight deviation from the traditional Staunton pattern can be seen in the Knight pieces, which are actually a variant piece designed by the Maestro, Frank Camaratta himself. It infuses the Staunton Knight with a bit more drama and emotion, as well as incorporates Camaratta’s love of Greek style architecture. The chess box completes this signature series wooden chess set set by providing a safe storage space for each piece to rest when they’re not being used. It comes in a variety of wood choices, including Red Burl, Bird’s Eye Maple, Mahogany, Olive Ash Burl, Bubinga Burl, Elm Burl, Macassar Ebony, or Brazilian Rosewood. No matter which wood you choose, each box comes with a luxurious green baize lining, brass hinges, inlaid colored accents, and a lock and key with a red tassel. This wooden chess set is one of our favorites due to the unique artistic processes it employs in its manufacture. Instead of using a naturally dark wood or staining a lighter wood dark to make Black’s squares and pieces, the designer of the Burnt Zagreb 59′ chess set actually started out with a lighter wood and carefully burned the edges so that it would appear black. The result is a vintage wooden chess set that is simply stunning. Each of the wooden chess pieces is hand carved by master artisans with impeccable attention to detail. These chessmen are modelled after a very popular design for chess pieces and one that was most notably used at the 1959 Candidate’s Match in Zagreb. The pieces of The Burnt Zagreb ’59 Chess Set are made of boxwood, burnt on the outside, and then carved again to show extra detailing. You really have to see it to believe how gorgeous the end result of this process is. Each piece is heavily weighted for satisfying gameplay and the bottoms are lined with luxurious billiard cloth. The pieces are finished off with a glossy finishing coat to make all of the details pop. This is a tournament sized chess piece set with a 3.875 inch tall King. 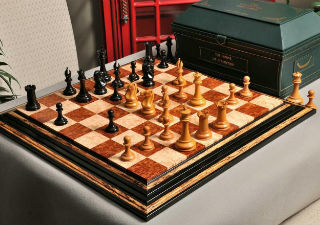 The chessboard is a traditional style that blends nicely with the unique colors of the burnt boxwood pieces. It is made of Blackwood and Maple and has 2.25 inch squares throughout. It is half an inch thick, with moulded edges that help it blend into the background, providing a non distracting backdrop for the chess pieces to shine. The board also has the House of Staunton logo silkscreened onto the h1 square. The set also comes with a chess box to keep your unique pieces stored safely when they’re not being used. 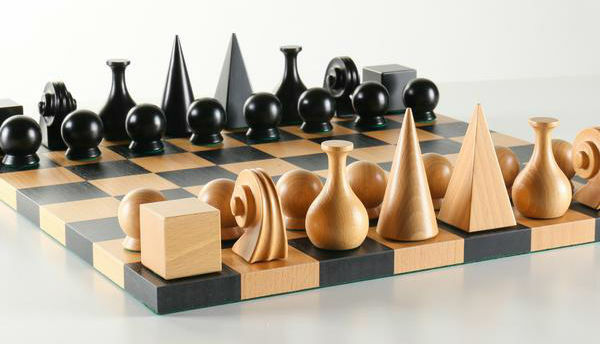 The Man Ray Chess Set is a very unique set with a distinctive, modern style. Its simple, smooth shapes, make this set an elegant addition to any modern home. Each piece was created by noted Dada-Surrealist artist Man Ray, and there is thoughtfulness and meaning behind every line. The Man Ray Wooden Chess Set would be a great choice for creative players with a unique sense of style who appreciate the modern design. The chess pieces are a careful recreation of a chess set made by Man Ray during his career from 1920 to 1976. The King piece is a pyramid, from the Egyptian symbol of Kings. The Queen is a cone, modeled after the headpieces of medieval Queens. A flagon shape represents the bishop, due to their historical involvement in creating spirits, exotic liquors, and other types of “potions.” The knights are carved into shapes modeled after the head scroll on a violin, and the pawns are tall and weighty to represent their increased importance in modern chess playing. Each of these pieces are handcrafted by artisans in Italy and Germany from the finest beech wood. In fact, most of the Man Ray chess set is made in Germany, except for the unique Knight piece, which is actually fashioned by an Italian violin maker and sent to join the rest of the set. The chessboard is also made of solid beech wood, with inlaid squares that have been stained black. Using the same exact type of wood for each piece and every inch of the chessboard gives this chess set a unique sense of cohesion that other sets simply cannot hope to match. This stunning chess set is one of the best wooden chess sets available today. It has built in coffered storage drawers, is made from the finest quality materials, and has every luxurious detail you can think of. The chess pieces included with The Collector Series Library Wooden Chess Set are hand carved by master artisans out of your choice of fine woods. You can choose Indian Rosewood, Genuine Ebony, or Blood Rosewood to contrast the Natural Boxwood of White’s army. It all depends on what kind of color scheme you want. Ebony is of course the darkest, almost black, which offers the starkest contrast. Indian Rosewood is a medium brown color that adds warmth without being so heavily contrasting. Blood Rosewood is an eye-catching red color that’s sure to grab attention from your guests. The choice is yours, they’re all beautiful and high quality woods. The design of the pieces is actually based on a design by Nathaniel Cooke dating back to 1849. 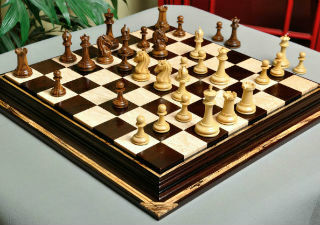 The replica set makes for an excellent collector’s piece for an vintage or antique chess lover. The chessboard is made from Walnut and Maple woods inlaid in a Cherry wood frame, so any of the chess pieces will look great on it. It has a vintage design to match the style of the replica chess pieces. 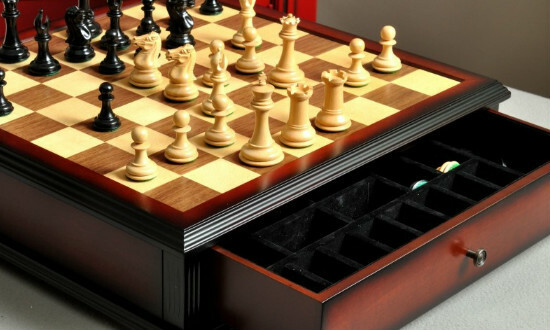 The two storage drawers imbedded in the chessboard do provide ample storage for all 34 chess pieces that come with this set, and you won’t need to worry about them bumping into each other and becoming damaged, because each one has its own padded compartment. 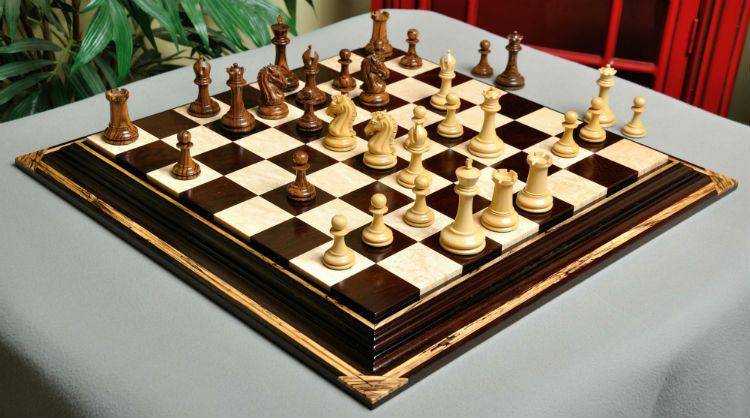 This hand carved wooden chess set is a full sized tournament set that is sure to turn heads. If you’re a fan of antique chess set design and painstakingly handcrafted wooden chess sets, this could be the perfect set for you. If you’ve ever looked at a wooden chess set and thought to yourself, “that’s nice, but I wish it were more colorful,” then we have the perfect handmade wooden chess set for you. 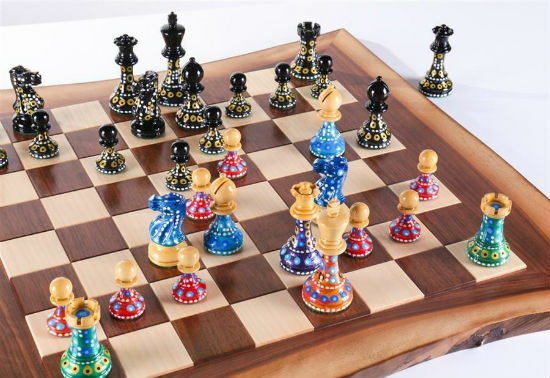 This wood chess set comes with one of a kind chess pieces that were hand-painted by artist Sydney Gruber. There’s not another set like it in the world! The black pieces are painted with designs of white and gold circles, but White’s pieces are where the artist’s talents really shine through. She has managed to turn plain and simple white chess pieces into individual works of art with swirling colors and eye catching designs. The Sydney Gruber’s Painted Chess Set will certainly get a lot of attention from your guests and opponents, there’s no doubt about that! Hues of purple, blue, green, orange, and red are splashed all up and down White’s pieces, leaving only the tops of the pieces untouched by the artist’s brush. The result is truly remarkable, and a must have for any artist who plays chess. The chessboard is every bit as unique as the pieces that play on top of it. It is carved from walnut and maple woods, with the artisan preserving the live edge of the wood as the edges of the chessboard. They form a sort of natural frame around the board and give the whole thing a unique, rustic, and quirky vibe. The board and the pieces work well together as a set. Think of the room you’d like to use your wooden chess set in most often. Is it traditionally decorated, or does it have more of a modern feel? The decor of the room will determine which style of wooden chess set will blend in nicely and which will stick out like a sore thumb. If you have a sleek, modern living room with lots of clean lines, a traditional style wood chess set may disrupt the flow of the room. 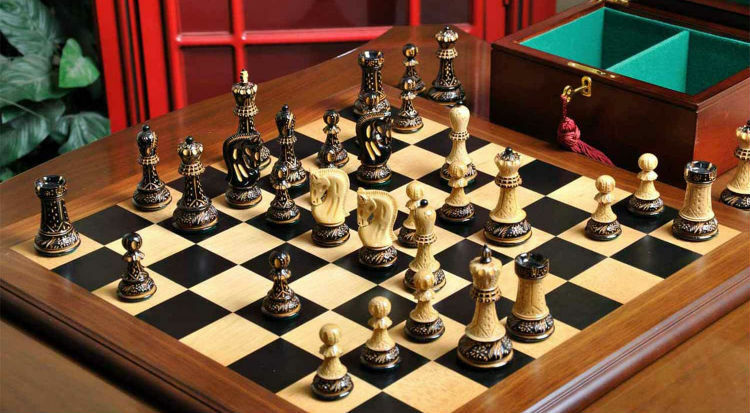 Likewise, a modern wood carved chess set will seem very out of place in a traditional style home – almost like seeing an actor with a fancy watch on in a movie that’s supposed to take place in the Middle Ages! Quality is a major consideration when buying any type of wooden chess set. If you buy a high quality set, it could easily become an heirloom piece in your family and last for generations. However, a poor quality set will break after a few months and leave you high and dry. Luckily, the sets we’ve assembled on this list are all of the utmost quality, so you don’t need to worry about that! The last factor is, of course, price. You should only spend as much as you can afford. That being said, buying the best quality wood carved chess set that you can afford is a good way to get an heirloom quality chess set. So, consider shelling out for a better quality product, but don’t break the bank. Chess Sets: Our reviews of The Best Chess Sets for Sale in 2019. Chess Drinking Game: Shot Glass Chess Set – Your New Favorite Drinking Game!